Forty young faces looked up expectantly. “Repeat after me,” I said, then paused for the translator. “Flor blanca y flor azul,” I sang, in a loud, clear voice. The children looked bewildered. A few ventured the first syllables, and then their efforts died out. I tried again, slower this time. Still, the sound was small and the voices unsure. They seemed to have no grasp of pitch or rhythm. This was not how I pictured our first lesson with the middle-school children of the town Santa Catarina Bobadilla, near the city of Antigua in Guatemala. I felt myself fighting back panic, and looked to my fellow team members for support. 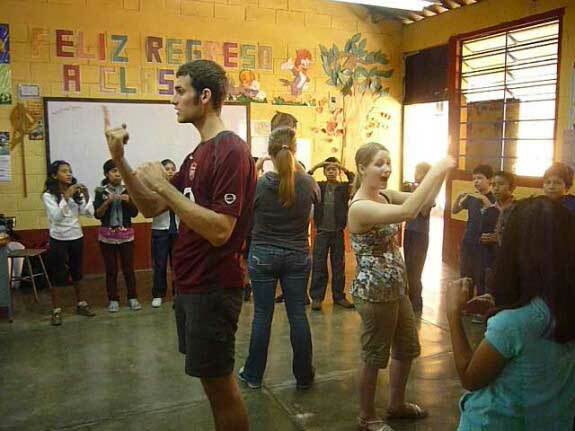 The four of us were part of Rayos de Canción (Rays of Song), a group of eight Juilliard students—musicians, dancers, and actors—who travel to Guatemala each spring to do performing arts outreach. Last year we had spent all of our time at a hospital for children and adults with cerebral palsy. 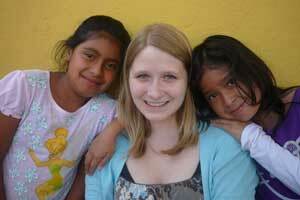 This year, we would expand our mission to work with Common Hope, a Minnesota-based non-profit that promotes family development in Guatemala. Most of their volunteer programs are literacy-based; we would be their first performing-arts group. We had planned a week-long music, theater, and dance residency for nine- to twelve-year-olds at a local public school where the children had no prior exposure to fine arts. During our months of preparation, we had endless planning meetings. The other musicians and I—violist Caterina Longhi, flutist Matt Wright, and percussionist Ian Sullivan—translated traditional old English folk songs into Spanish, and crammed our suitcases with dozens of tambourines, rhythm sticks, and egg shakers. 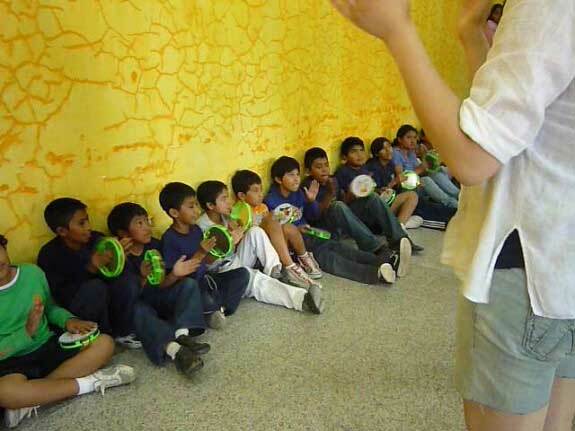 Our idea was to teach them to sing in simple harmony, using vocal rounds. I worked out detailed lesson outlines for every music class, scheduled down to the very minute. But our first class had hardly begun, and the kids were growing restless. Clearly we were going to have to improvise. After a few moments of chaos, Ian decided to try something bold. He walked to the front of the room in silence, and held up his hands, his palms face down, and fingertips touching. The absence of verbal instruction, combined with his serious expression, provoked a change in the atmosphere: the kids grew quiet, and a look of concentration swept across their faces. Ian motioned for the kids to copy his gesture. He sang the words again, using a simplified version of the hand signs developed by composer Zoltán Kodály in the 20th century. The placement of his hands in relation to each other served as a visual aid for the pitches. Because the song we were teaching was mostly stepwise, the hand signs were useful for demonstrating the movement of the pitches: up a step, down a step. He went through the first line of the song, literally one note at a time, adding one new note after several repetitions. The kids were starting to catch on, and I saw their faces light up as they made the connection between the movement of their hands and their voices. Without saying a word, Ian had effectively taught the entire class the first line of the song, using the hand motions, in about ten minutes. Although her advice seems obvious in retrospect, it was an epiphany for me in the moment. Growing up, my experience as a member of children’s choirs and orchestras involved formal, rule-bound codes of behavior. Now I teach in the Music Advancement Program at Juilliard—a Saturday instrumental instruction program for underrepresented and minority students—and I’m used to teaching children with similar ingrained understandings. 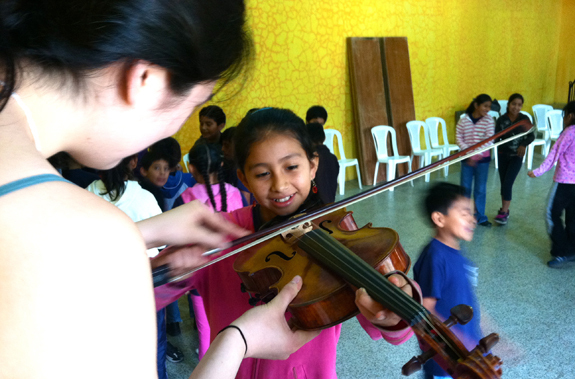 I had expected the Guatemalan students to be able to parrot the music back to me, which would have required them to have a set of skills that I took for granted because of my own privileged musical background. But these children seemed unfamiliar with even the simple joy of group singing. Although we had done so much research and preparation, we still hadn’t seen past our cultural assumptions. Revising our expectations on the fly, we decided it was no longer a goal to prepare a flawless performance. The process would be more important than the product, and we would make it fun. We decided to focus on teaching them only one song instead of three. We broke our lessons down into simpler steps. On the second day, we introduced the students to the instruments we’d brought them. They were incredibly excited. We decided to let each choose his or her own instrument, and we divided them into groups. Our original plan had been to teach patterns that they would play against each other, using syncopation and dotted rhythms. We instantly realized that this approach, like our first attempt at teaching singing, would be a disaster. Our new strategy was to clap short rhythms and have all the students repeat them in unison on their instruments. The kids loved it. We also worked with them on the idea of dynamics. We “conducted” the group, encouraging them to play as softly, and then as loudly, as they could (which resulted in a couple of broken rhythm sticks!). By the end of the week, the children performed their round, accompanied by their hand gestures, for the rest of the school. They sang loudly and with great gusto, if not always perfectly on pitch. After the performance of their rhythm instruments, they broke into clapping and hollering that was even more deafening than the sound of 90 tambourines. The four of us have performed many times in Carnegie Hall and Avery Fisher Hall, but we’d never heard more excited applause. Hello! I could have sworn I’ve visited your blog before but after looking at some of the posts I realized it’s new to me. I just couldn’t leave your web site before suggesting that I really loved the usual information a person provide for your visitors? people join MLM opportunities as a consequence of who introduced them. understand what you’re speaking about! Bookmarked. Kindly also visit my website =).